In Oregon, the state owns all geothermal resources located on state land and some resources on land previously owned by the state. See ORS 273.775 to 273.790. There is a process to acquire geothermal rights from the state. See Acquisition Application. Oregon has a geothermal leasing process for geothermal interests retained by the state. The Geothermal Lease Regulations are administered by the Oregon Department of State Lands. General licensing information is available on Oregon's Licenses, Permits and Registrations Geothermal webpage. 3-OR-a.1 - Has the environmental process been completed? 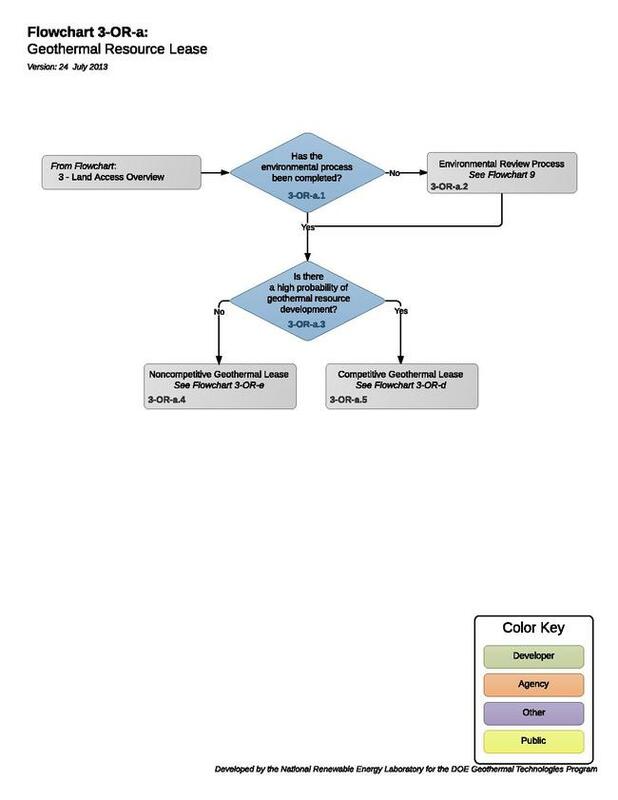 Under OAR 141-075-0035(2), "an environmental impact assessment which documents the factors considered by the applicant in his formulation of the geothermal project for which a state lease is required" will be required before the lease can be granted. The environmental assessment is used to determine appropriate conditions to include in the lease. The Oregon Department of State Lands has a coordination plan they use to circulate land actions in order to ensure all land use and environmental considerations have been addressed. Oregon does not have comprehensive environmental statutes. The environmental studies required under OAR 141-075-0035 satisfy the geothermal leasing requirements. A part of the environmental review will likely take into consideration potential impacts on the coast. The Coastal Management Program staff at Oregon Department of Land Conservation and Development also participate in various local and state permit reviews for projects proposed in Oregon's coastal zone. In some cases, Oregon Department of Land Conservation and Development is reviewing a federal action concurrent with the local or state permits. But Oregon Department of Land Conservation and Development also reviews various local and state permits as a commenting agency only; i.e., the department participates as an interested party but does not make any regulatory decision. 3-OR-a.3 - Is there a high probability of geothermal resource development? Under OAR 141-075-0520, a Designated Geothermal Resources Areas (DGRA) may be established "upon a finding that a high probability of geothermal resource development exists." If there is a high probability of geothermal resource development, the Oregon Department of State Lands is most likely to use the competitive geothermal leasing process. Otherwise, the noncompetitive leasing process will be utilized. This page was last modified on 17 August 2018, at 18:42.